This chapter is not meant to be a manual on how to catch bass. Bass are the major quarry of the bass angling sector in South Africa, which generally use lures to catch bass, usually on a catch and release basis. But largemouth bass, and to a lesser extent, smallmouth and spotted bass, now share many waters across the country with indigenous and other alien fishes and are increasingly available to flyfishers who target a range of fish species. My purpose in writing this section is to raise awareness of the basses amongst flyfishers, especially the more common largemouth and smallmouth bass, focusing on their biology, behaviour and their good and bad points. In the Western Cape in particular, smallmouth and spotted bass have been a major factor in literally wiping out some of the endemic indigenous fishes and to most South African conservationists they are seen in a negative light, although the smallmouth is a prized quarry amongst bass anglers. Regulations for alien fish species were approved in 2014, which control the use of invasive alien fish species such as the three bass species These regulations recognise the value of bass in waters where they have legally been stocked, but also prevent their stocking into new waters because of their know impacts on biodiversity. Bass are excellent gamefish which also provide good eating. However, because of their potential impact on the aquatic environment, all bass caught in rivers should be killed whereas those caught in recognised bass dams and farm dams may be released. Range: Native to the eastern seaboard of North America, M. salmoides was introduced into South Africa in 1928 for angling purposes. Jonkershoek hatchery, outside Stellenbosch, received the first consignment and it was then widely stocked across Southern Africa. The species is now widespread in all nine provinces, and very common in farm dams and big public dams with reasonably clear water. It has also established itself in several slow-flowing rivers in the Eastern and Western Cape, and in the Vaal River above the Barrage. Size and Weight: Reasonably fast growing in productive waters, attaining 40 centimetres and 1 kilogram after two years when they start breeding. Habitat: Largemouth bass are very structure-orientated as this allows them to ambush their prey more easily. Behaviour: Juveniles school but adults are more territorial. The largemouth bass preys on smaller fishes, frogs and aquatic insects, feeding most actively in early morning and late afternoon. It is an alert and intelligent fish that frequently cruises its territory. The spawning season is in late spring (October) and males typically guard nests and fry in shallow water. Season: The best seasons for catching bass are spring and autumn � summer is also good, but then you have to be out very early or very late. Big fish can be caught in winter, especially in the warmer areas, but you have to retrieve your fly slowly and close to the bottom. Wherever possible, fish areas with lots of structure such as weedbeds, lilypads, rocky reefs, and submerged trees. Also look for cruising fish in clear waters as well as for swirls and splashy rises (bass trying to catch adult dragon flies) that betray their presence. Start off with an intermediate line and a #6 beadhead dragonfly nymph imitation or Strip Leech streamer. Cast towards structure, allow the fly to sink, and watch the line closely as this happens � largemouth bass often pick up the fly very delicately as it sinks. Thereafter, actively retrieve the fly in short strips. The take will be obvious. Strike hard (bass have tough mouths) and immediately apply side and upwards pressure to keep fish away from structure. Largemouth bass are powerful fish and, especially, if you fish near structure, you'll need a rod with considerable backbone to control a good fish on its first run for sanctuary. If the bass manages to reach its refuge you may be faced with the prospect of having to wrestle it from heavy cover. For this type of action a 7-weight is about the lightest rod you should consider. You will probably have to fish your flies at different depths during the course of a day, and you should therefore carry matching floating, intermediate and sinking lines. Remember that most of your fishing is likely to be done in dams and deep pools in rivers. You hardly need more than 20 metres of backing but if you fish for other species as well you may feel more comfortable with 50 or 100 metres. For surface fishing a 2.5- to 3-metre leader is adequate whereas with subsurface flies you can decrease that to as little as 1 metre. If you fish near heavy cover your tippet should test not less than 5 kilograms. Largemouth bass have big mouths and prefer eating large prey, so use #2 to 8 flies that imitate aquatic creatures like dragonfly nymphs (there are dozens of patterns), baitfish (the Muddler Minnow and Strip Leech are good choices) and frogs. Poppers also work well in low light, and the surface take of a large bass as the sun sets is always a memorable event! The SA angling record for M. salmoides is 4.5 kilograms. There are many inland waters (public and private dams, lakes and rivers) across South Africa that offer excellent fishing for largemouth bass. These are too numerous to mention here. For advice on the best waters in the province you intend fishing, consult a national bass angling magazine or make contact with the local chapter of SA Bass or a good dedicated fishing tackle shop. Range: The smallmouth is native to the eastern seaboard of North America, but it inhabits cooler waters than largemouth bass. It was first brought to the Jonkershoek hatchery in Stellenbosch in 1933 for angling purposes, and was then stocked in selected waters elsewhere in the country. The most successful stockings have been in Western Cape rivers, where the bass have adapted so well that they have virtually decimated the indigenous fishes of the fynbos region. Size and Weight: Although it grows more slowly than largemouth bass, it can still attain 40 centimetres and 1 kilo after three years in productive waters. Habitat: The smallmouth is also very structure-orientated, and is particularly partial to rocky reefs and ledges because of the abundance of crabs, aquatic insects and minnows in these places. During summer, fish in stillwaters seek the comfort of the cooler water below the thermocline which is usually from 2 to 3 metres below surface. 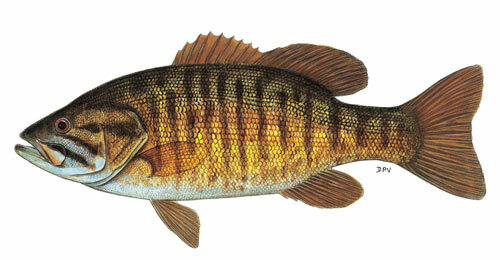 Behaviour: The smallmouth bass is also territorial and preys on smaller fishes, frogs and aquatic insects. During warmer months, it is commonly active in early morning and late afternoon. It is bolder than the large-mouth, and often approaches divers doing fish-survey work in the clear Western Cape rivers. The smallmouth breeds in spring, usually 2 to 3 weeks earlier than its largemouth brethren. The male guards the nest and fry. It is an excellent gamefish that readily take patterns intended for yellowfish and it is also provides very good eating, and is more tasty than the largemouth. Season: The best times to catch smallmouth bass are in spring and autumn; in summer focus on early mornings and late afternoons. Smallmouth bass prefer cooler water, so expect good catches in winter too. It stands to reason that you should focus your efforts where there is an abundance of rock. In the absence of any surface activity, start with an intermediate line. A #6 beadhead damsel nymph imitation or a streamer is always a good choice � the Mrs Simpson and Walkers Killer are especially loved by smallmouth, perhaps because they resemble a range of food choices and are easily visible to fish. Smallmouth are easily caught on a well-presented fly and I have had fish on, then lost them, only to catch them several casts later with signs of hook damage on the jaw. Cast towards the structure and allow the fly to sink, watching the fly line closely in case of a take on the drop. When the fly reaches the target zone start retrieving it in short strips. The take is gratifyingly obvious with a smallmouth. With big fishes, the strike is usually so solid that you often feel hooked up on hard structure! Strike hard, enjoy the dancing rod and immediately apply side and upwards pressure to lead your quarry away from the structure. The smallmouth fights much harder than a largemouth bass, and fish weighing more than 1 kilo are a worthy and enjoyable quarry. You can use the same tackle for smallmouth as for largemouth but, on some rivers, you may be somewhat overgunned. Here you can switch to a 6-weight or even a 5-weight outfit. Your choice of flies should lean towards smaller sizes, say #6 to 10. Smallmouth are not tippet shy, so a tippet strength of 3 to 4 kilograms is recommended. The SA angling record for M. dolomieu is 2.8 kilograms. There are far fewer hotspots for smallmouth than for largemouth across South Africa, with the prime smallmouth waters mostly in the Fynbos regions of the Western and Eastern Cape. The Breede, Olifants-Doring, Berg and Gourits rivers of the W. Cape all have river stretches that offer excellent smallmouth fishing. Perhaps the most consistent and reliable is the Olifants-Doring where most areas on the mainstems will deliver good catches. The best dam is likely the Clanwilliam Dam which hosts national and international bass tournaments. It is the one dam in the country where it is possible to catch three bass species; smallmouth, largemouth and spotted bass. One of the best waters used to be Voelvlei Dam, about 120 km from Cape Town. The illegal stocking of catfish into its catchment has decimated a once thriving bass fishery.